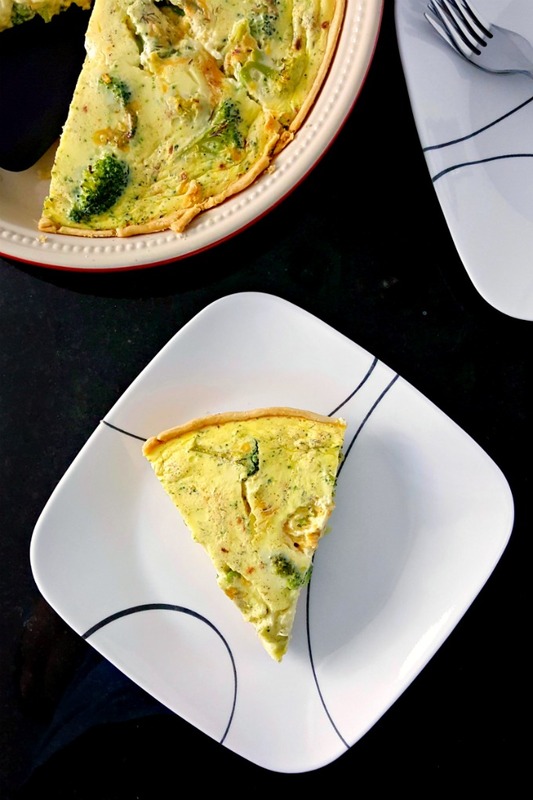 Creamy Broccoli Cheddar Quiche is super creamy and less egg like in taste and texture. Remembering a recipe from my childhood, the cream is scalded before being added to the egg mixture making a custard based creamy quiche. Happy Spring, dear readers! I hope winter is finally over and we start to see the colors of spring. Don’t get me wrong, I love the cold weather of fall and winter. Even for me, winter and cold weather has just gone on long enough. I long for those warm days of spring and colors that pop out what seems like overnight. I miss grilling. Yes, I know, die hards will grill no matter what the temperature, but I’m sure they weren’t firing it up when it was negative 10, 20, or 50 like it was a few times this winter. If you did, then kuddos to you! But this week isn’t about grilling. It’s about Easter recipes. And for me Easter recipes are all about eggs and brunches recipes! It’s about spending time together hunting for eggs and treats hidden by the Easter Bunny! I think I tell this story in almost every Easter post, but since I have new followers I’m going to tell it again. Because I look back when I was a kid celebrating Easter and how my parents made sure we believed longer than most. My sister and I would get up early Easter morning. Well, more her than me. My parents never hid the eggs outside. They were always in the house somewhere. And let me tell you, we found them all except for one year. One year there was one missing. Now, just like every kid that celebrates Easter, we decorated our eggs with your typical egg dye. And we would remember who decorated which when it came time to find them. However, we would always find these colored eggs we didn’t remember dying. And every year we would try to copy that color, but never could. Come to find out, the parents would boil eggs with onion peels to create the Easter Bunny color, which is a golden brown color. I think we were teenagers before they told us. And since then, I always look for natural ways to color eggs. Story time is over! Well, not really. One spring I decided to clean the inside of our new fridge from top to bottom. I emptied the fridge, shelf by shelf, and cleaned all the nooks and crannies. Then I did the same for the freezer. Now, I tried to empty a shelf, clean that shelf, and then move on the next one. But, here’s the kicker. I’m not so great on my knees. I mean, I have OA in both of them, so getting up and down from off my knees is not something that happens quickly or easily. Just saying. I’m nearing the final stretch of my project and I’m cleaning out the frozen water that’s hovering around the drainage tray in the freezer and then the fun begins. Do you know what a thermistor is? Neither did I until I accidentally pulled it out of its slot in the freezer. Because once I did that, the coils in the freezer kicked on and water started pouring out the back of the freezer. The thermistor tells your fridge when it needs to kick on and off. Basically, it’s the thermostat. Why they don’t just call it that, I have no idea. I quickly finish up my cleaning and put all the food back in the freezer and try not to have an anxiety attack. I am OCD checking the temperature on the freezer almost every 30 minutes. It climbs to 14 before it starts to come down again around bedtime. What exactly happened? I inadvertently tripped a defrost cycle that lasts about 30 minutes. Having never done this before I had no idea what it was, how long it would take, or what in the world was going on. Things they don’t tell you when you buy a house. What does all this have to do with this broccoli quiche? Nothing. It just happened to be the anecdotal story I decided to share about my life in the kitchen and in our not so new home. I say not so new because we’ve been there almost a year now. I can’t believe how the time has flown! But, after this month is over we can FINALLY make this house ours and start looking at paint colors. Just like the gorgeous color in this quiche. It’s rich with broccoli cheddar flavor. And scalding the milk truly does change the texture and flavor to the custard that’s baked into this quiche. It truly becomes a custard and not just eggs baked with broccoli. Its silky smooth texture adds a level of decadence to this quiche that I had forgotten about. I see that I haven’t told that story yet. Something for y’all to look forward to! What things did you learn after you moved into your first house? Words of wisdom to share for this new home owner? Place the pie crust in a 10” round pie pan and refrigerate. Combine the egg substitute with the next five ingredients (dill through red pepper flake) and set aside. Place the cream in a small saucepan over medium-high heat and heat until bubbles begin to form around the edge of the pan (scald). Remove from heat and, whisking continuously, slowly pour the scalded cream into the egg mixture. Remove the pie pan from the refrigerator. Arrange the broccoli in the bottom of the pan and sprinkle half of the cheese on top of the broccoli. Slowly pour the egg mixture over the broccoli stopping just short of the edge of the crust. Give then pan a little shake to ensure the mixture is surrounds the broccoli and is all the way to the bottom of the crust. Sprinkle the remaining cheese on top and bake for 45 to 60 minutes or until the custard is set. Allow to cool slightly before slicing and serving. This looks beautiful! I love all of the hearty pieces of broccoli! I know my youngest would love this because hs loves broccoli and eggs! Such an interesting combo for a kid… I most certainly didn’t like broccoli and eggs when I was younger. But I love them in this quiche. I hope you do! They’re so good. And easy to whip up for a crowd. Thanks for all the food stories and memories. I would definitely have been screaming my husband awake LOL. When I worked afternoons road patrol we always had Easter Brunch and quiche was always present. Yours sounds amazing. Thank you. Quiche was typically our Christmas breakfast, but I’ve been trying to sneak it in other holidays, too. I’m always looking for new quiche recipes, so I’m glad to have found yours. I love broccoli and cheese, so this sounds perfect! Thank you! I hope you enjoy it. It was mighty tasty. And thanks for hosting such a fun party! Thank you! Oh my! We looked at one foreclosure property. It was TRASHED and definitely not worth the money to fix it up…since we didn’t really have extra to fix it up. This looks delicious! I’m a big fan of quiche. Thank you! I am, too, Denise. It’s so delicious and I have such fond memories of Christmas quiche Dad used to make.